Q. Your reaction at the end suggested it was a very important victory for you tonight in all the circumstances. RAFAEL NADAL: A lot of tension, because when you play this match against him, I said yesterday, no, the match can be decided for two points, one point. So, you know, the first set, my feeling was I was playing a little bit better than him the first set. But seriously, we arrive at the 5-4 and he played an unbelievable game. So, you know, you lose a set against Karlovic, and, you know, you are under pressure the rest of the games of the match. So I think I played a fantastic second set returning better than ever, I think. In the third, I didn't have chances. His serve was unstoppable. You know, in the tiebreak I was really nervous. I think I returned fantastic in the tiebreak, but I didn't put no one first serve on court, so I was really nervous. For sure, it is a very important victory for me, you know, being in semifinals another time here after one month outside the competition is fantastic new for me. Is a good result in hard court, and, you know, you never know what's going on right now on the tournament. But for me, be in semifinals, I'm very happy for that. Q. Can you talk a little bit about your service game? That third set you only gave up two points on your serve going into the tiebreaker, and only three points on your serve in the tiebreak, so only five in the third set. Can you talk about how well you served? RAFAEL NADAL: My opinion I didn't serve that well. In the tiebreak, my serve was terrible, that's for sure. But before that, I was serving with high percentage, I think. I don't know my percentage, but that's what I had to do. Because in my opinion, I can't give him opportunities with the second serve to try -- because he was playing very aggressive with the forehand, with every second serve. So my feeling was I had to put first serves inside and try to have the control of the point with my forehand. I think I did well, because he didn't have not one opportunity in all the third set, so that's always very positive. But at the same time, I didn't have a lot at the return, too. Q. Let's talk about reading his serve because of the height, the toss. RAFAEL NADAL: I don't know. It's like a penalty every time, I said yesterday. You have 50% to know where the serve gonna be. And after that, if you are right with the place, with the direction of the serve, if he serve very close to the line, you don't gonna have chances anyway, too. You know, I was there sometimes, but the ball is still very far. So no chances. Q. Do you think it's possible now that you're in the semifinals, perhaps you can relax a little? I mean, as you say, coming back after so long, every match is very important for you. You're a little nervous. Perhaps now you played this number of matches, you can be a little bit more calm in the semifinals? 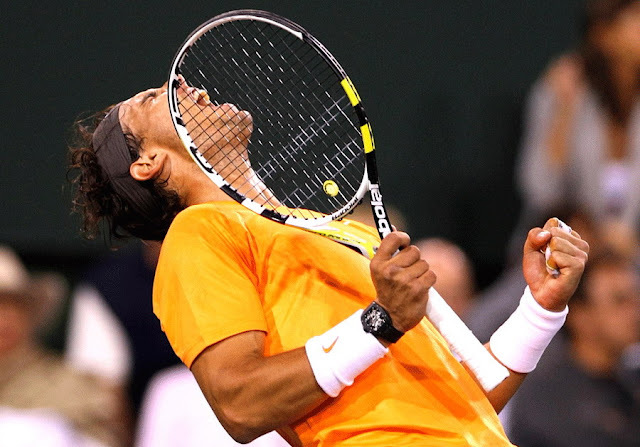 RAFAEL NADAL: I have to be; if not, I gonna have not one chance. I am sure I can be more relaxed, because I passed very important matches for me. Because losing second round, third round, gonna be tough. The match of today, you know, was the first one that I felt really that even if I play well, I can lose. That's always hard, go on court with this feeling. And the rest of the matches, my feeling was if I play good, normal, I gonna have big chances to pass, no? But today was completely different situation. And, yes, I am a little bit more relaxed because I know I did a good tournament anyway. Q. You did talk about how returning his serve involves a lot of luck. When you look back on the second set, do you chalk that up to just getting lucky and guessing right, or were you actually feeling it a little better? RAFAEL NADAL: I was -- inspiration? Full inspiration that moment, no? Because I was lucky to do the first break in the second game of the second set, and after that was big confidence for me, no? Because I know gonna be difficult for him to break me anyway in the second. So I felt I was in a good position to win the second set, and I was able to play more aggressive in the rest of the returning games. If I had mistakes on the return in that second set, doesn't matter for me, because I had advantage of one break, and I felt that was enough. So I played aggressive, and all the returns was going inside. I don't know why. Q. What about playing Juan Martin in the next round? He's won the last three times that you have played. Your head-to-head is very close. What are your thoughts on playing him? RAFAEL NADAL: He's one of the best of the world, for sure. He's coming back after one year outside of competition almost. So when you are in a difficult situations like he was last year and you come back and you start to win, you are stronger than before because your motivation and you want to -- you know, you want to recover the time that you lost for one year. So, you know, I know how is this feeling, but the more difficult of the match is not this. The more difficult is I play against top 5 in the world for sure. And on this surface, I am sure it is like this. So we will see. I know I have to play better than what I did every day, but for me was a big improve today from yesterday, so that's a positive thing. I have to keep improving much more to have chances on the semifinals. I gonna work tomorrow on the doubles to practice, and I hopeful with this confidence and everything I gonna be able to play a fantastic match, because that's all the way.